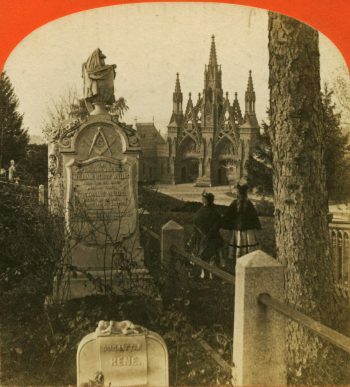 The Green-Wood Historic Fund (GWHF) provides photocopying and reproduction services for materials contained in the GWHF Collections and The Green-Wood Cemetery archives for educational, personal, and commercial use. Requests for scans and/or reproduction rights may be submitted through the Reproduction Request Form. All materials are subject to copyright law. Users agree to abide by the regulations of U.S. copyright law (U.S. Code, Title 17). Any violations of the copyright law are the responsibility of the researcher and are not the responsibility of GWHF. GWHF allows photography of materials of the collections and archives for research purposes. No images are to be reproduced without express written permission of GWHF. • Single sheets must be kept flat on the table while being photographed. Books, bound manuscripts, and other bound materials must be photographed while in a cradle. • No photos of the archival research room are permitted. • Only handheld, still photography cameras are allowed. This includes iPhones and similar devices. • The use of flash photography is not permitted. • Tripods, chairs, stools, ladders, or other devices to adjust the angle of photography are not permitted. GWHF staff will provide on-site black and white letter-size photocopies of materials for researchers, at the discretion of GWHF. •Staff will assess whether or not photocopying will damage the materials in question. We reserve the right to refuse to photocopy certain materials. •Photocopies cost 50 cents per page. •Large orders may not be fulfilled the same day they are requested. GWHF offers digital files of scanned photographs at cost. •Requests are to be submitted through the below Reproduction Request Form. •Subsequent to receipt of your request, GWHF will reply with an invoice for the cost of the request. •Payment in full must be made before the order can be processed. Payment may be submitted online or by check payable to The Green-Wood Historic Fund. •Fees vary depending on stated usage and file format, as outlined in the fee schedule. •Digital files are supplied via email or Dropbox. A reproduction fee is required for all materials requested from GWHF. GWHF charges a reproduction fee to anyone wishing to obtain images of materials from GWHF. In addition, GWHF charges a reproduction rights fee to anyone wishing to publish supplied image(s). All fees will be determined by GWHF staff. The below application may be used to request image files of materials from The Green-Wood Historic Fund Collections and/or The Green-Wood Cemetery Archives. Fees vary according to materials requested and intended use. If you have any questions or would like to make a detailed request, please email stacylocke@green-wood.com. Under “Description of item” please be as specific as possible. Include any object identification numbers, page numbers or sides, and other applicable descriptive information. Under “Intended Use” please specify where the requested image will appear. If it is to be used in print, please name the publication, publisher, and intended date of release. If it is to be used on display, please provide the name, location, and date of exhibition. The Green-Wood Historic Fund will reply as soon as possible with an invoice for the cost of the request. Payment in full must be made before the order is processed. Payments may be submitted online at green-wood.com or by check payable to The Green-Wood Historic Fund. Do you need this rushed? Any additional requests? Please be as specific as possible. Include any object identification numbers, page numbers or sides, and other applicable descriptive information. Please specify where the requested image will appear. If it is to be used in print, please name the publication, publisher, and intended date of release. If it is to be used on display, please provide the name, location, and date of exhibition.